Our Metallized and Holographic papers are manufactured by transfer process in which we use very sophisticated techniques and formulations to make it more effective for our customers and make the metallized surface compatible for printers. Our unique formulation of transfer films for transfer papers contains components which meet the required criteria of sustainability and unique effects. We offer a wide range of colours in our Transfer paper like Silver, Gold, Green, Red, Pink etc and other colours that can be made available on customer's demands. 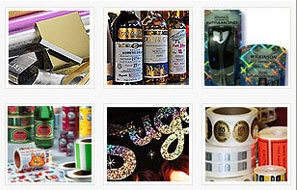 Other than this, we have all popular Holographic pattern in our Holographic Paper range which is acceptable worldwide. Not only the regular Holographic designs, Rasik Products Private limited also has the facility to provide customized solutions to their customers in the form of Customized Holographic Paper. Our Metallized and Holographic paper has no limitation of inks for printers and converters and they can use any type of inks on it. Our metalized and holographic paper is available in Jumbo rolls and sheet form which don't have problems like curling and loss of moisture. The reflectivity is exceptional and smoothness is equal to coated board. This makes metallized papers perfect for high-end applications. We can also produce customized papers to suit clients' particular needs. Our Transfer Holographic paper have excellent print-ability properties and gloss which gives mirror finish effects and make the product more attractive by decorative laminates. Our Tansfer metalized paper and Holographic paper is mainly used by labels industry including Liquor labels, Beer labels, Cosmetic labels, high end stickers and other purposes. Copyright © 2019-20 by RASIK PRODUCTS PVT. LTD. All Rights Reserved.